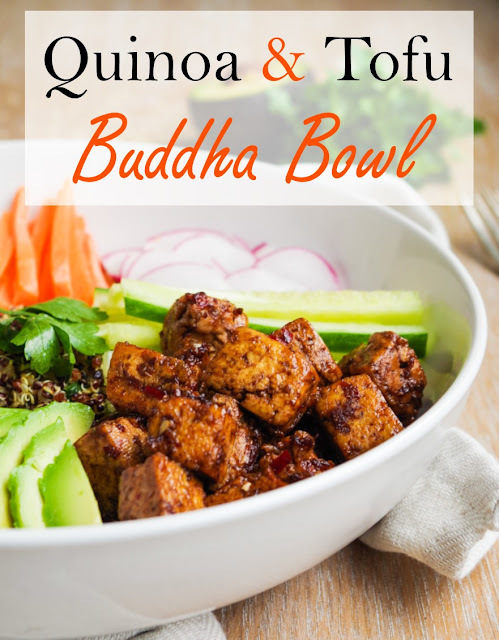 There's something wonderfully simple about this next recipe, thinly sliced veggies on a seasoned quinoa base and the most incredibly sticky tofu. It's nutritious, delicious and is great for lunch (or even dinner too!). I fried the tofu in a splash of sesame oil until it was crisp and golden, then coated in a mix of tamarind, soy sauce, ginger, garlic and chili - it's fragrant, sticky, a little sweet and spicy too and it might just be my favourite tofu marinade yet! The tofu is delicious both hot and cold, which is perfect for lunch on the go. I then seasoned the quinoa up with soy sauce, lemon juice, plenty of fresh ginger, coriander and a splash of apple cider vinegar - the seasonings really compliment each other and I love the tangy flavour from the lime and ginger, with fresh notes from the coriander. Quinoa is technically a seed but is used as a grain in this recipe - I used the tricolour variety, but the regular white quinoa can also be used in it's place. 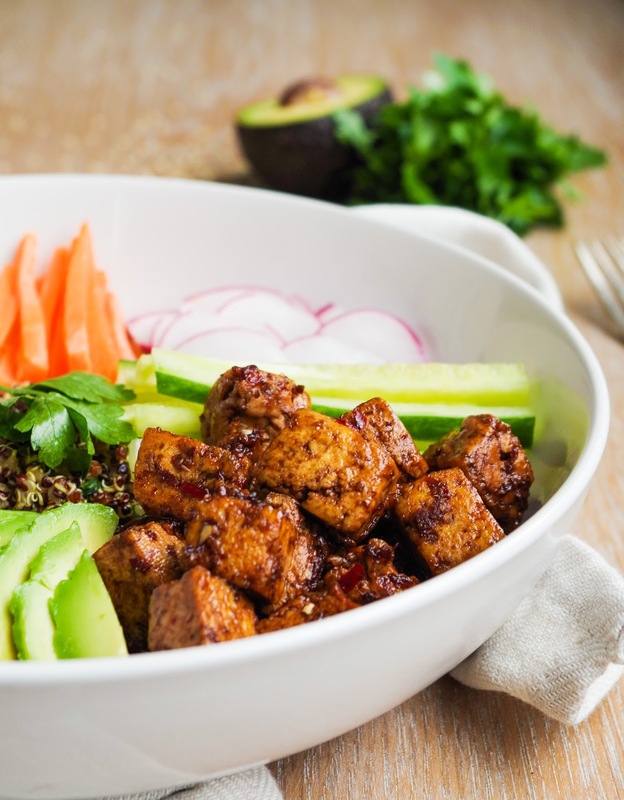 It's high in protein and also contains minerals iron, magnesium and manganese, which adds some extra nutrients to this already fantastic bowl. 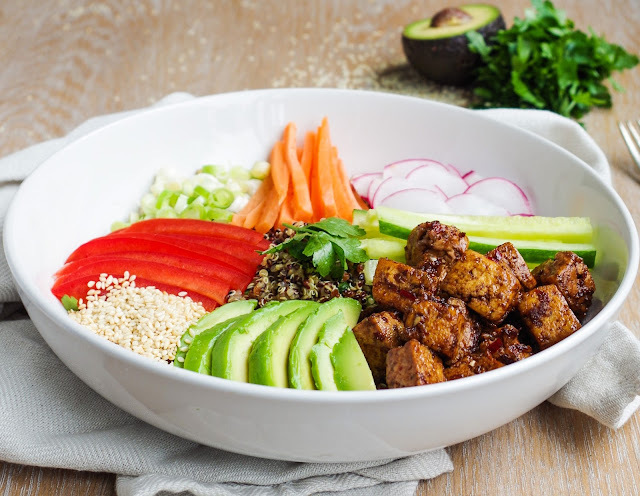 I topped the bowl with cucumber, radishes, carrots, spring onions, red peppers, toasted sesame seeds, avocado and of course that gorgeous sticky tofu. 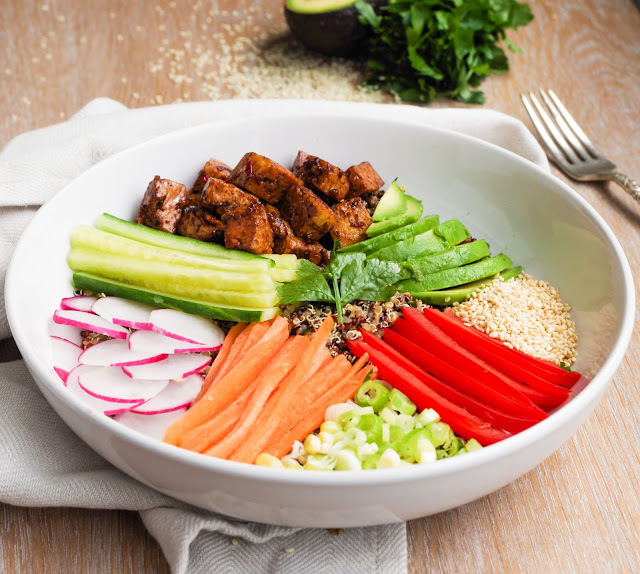 With all those fresh veggies, this bowl is packed with plenty of vitamins like A, C, K, potassium, from the sesame seeds - calcium, iron, magnesium and copper and from the avocado vitamin E as well as the all important role fats have in the absorption of fat soluble vitamins from the veggies. So get prepping for those delicious lunches! Rinse the quinoa thoroughly, cover with water and boil for 20 minutes or until tender, then drain. Drain the tofu and cut into cubes, fry with a splash of sesame oil until browned. Meanwhile, peel and grate the ginger, crush a garlic clove and finely chop a chili, then mix together with the tamarind, soy sauce, lime juice and sugar. Pour over the tofu and cook until reduced. 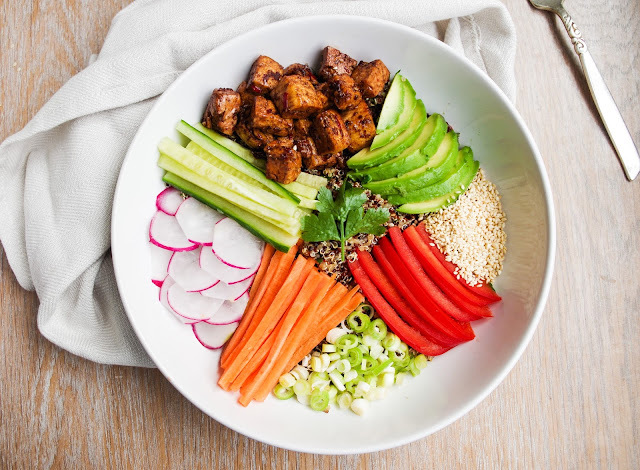 Prepare the carrot, red pepper and cucumber by chopping into matchstick pieces, thinly slice the radishes and spring onions and slice the avocado. Toast the sesame seeds in a dry pan until they're golden brown. Season the cooked quinoa with grated ginger, finely chopped chili, coriander, lime juice, cider vinegar and soy sauce. Arrange the bowls with a base of quinoa, then top with the prepared veg, tofu and sesame seeds. Serve up and enjoy!